Today a handful of us left the hill at 4:30am to go to the Louisville Cathedral of the Assumption for Holy Mass. His Grace Joseph E. Kurtz, D.D., officiated the Mass. 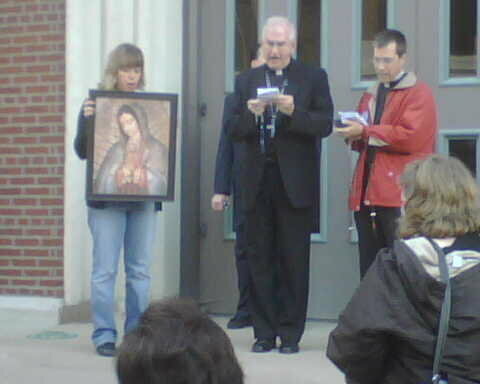 Following Mass, Archbishop Kurtz led a rosary procession for several blocks to the abortion mill, where we remained in prayer for some time. It was a powerful image to see an archbishop kneeling on the dirty sidewalk praying for an end to this evil and for those who obtained abortions this day. 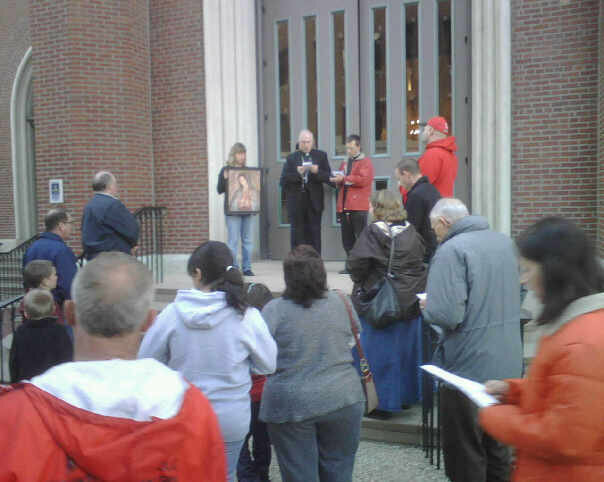 We then processed back to the Cathedral, still praying the rosary. There was a solid presence of people taking part. Not bad considering the early hour. Let us continue to pray for the 40 days for life campaign–and do all we can for its success. These photos are from the very end, after we had returned to the Cathedral, where His Excellency led us in prayer. I am very impressed by Archbishop Kurtz. This entry was posted in Catholic News, Prayer, Reflections, Rosary. Bookmark the permalink.